A Metaphysical’s Way of Fire records a journey into the labyrinthine maze of the Mystic Way. Written over 30 years, the poems are arranged to describe the young poet’s turning away from the social world near London and his descent towards his centre, first in the West, then in the East – in Japan, where he has his first glimpse of illumination. This leads to a Dark Night in North Africa where he undergoes a purgation, and, back in London, he has further experiences of illumination and visions. The Mystic Way is now an ascent through rapture, certainty and meaning to a unitive vision. The mature poet now understands the relationship between Existence, Being, Non-Being and the One. He has won through to a contemplative vision of meaning in a fourfold universe. A Metaphysical’s Way of Fire, Nicholas Hagger’s selection of his mystic poems, shows his growth towards a unitive vision which resulted in his unitive approach to history and philosophy, and to the One in literature. In art the metaphysical perspective manifests as the Baroque (a mixture of Classicism and Romanticism), and this work began a Baroque Revolution in poetry. It attracted the attention of the then Poet Laureate Ted Hughes. The poems follow the mystic path of Dante, St. John of the Cross, Blake, T.S. Eliot and Yeats. They enter territory that is scientific and cosmological as well as metaphysical as Nicholas Hagger advances his holistic/Universalist vision. There are over 60 pages of Notes the poet himself has written and there are two important Prefaces, one on the New Baroque Consciousness and the Redefinition of Poetry, and the other on the Metaphysical Revolution. The Notes and Prefaces take the reader deep into the author’s metaphysical vision. The rediscovery of the metaphysical vision in these highly accomplished poems effects a Metaphysical Revolution in our time. Since the Second World War English poetry has become almost exclusively social and secular. It has woefully lost contact with poetry’s true ancient, traditional and perennial task of mirroring the contemplative, metaphysical vision of God as the universal and internal Fire or Light. Here is a new, distinctive and original metaphysical voice. This selection, drawn from 30 years of poetic output, records a fascinating journey along the Mystic Way by a highly accomplished poet. The Mystic Way is one of transformation – from the social ego to a new centre in the soul and spirit, from the social to the metaphysical. Starting near London, the poet treads a Way that resembles a labyrinthine maze, first in the West and then in the East. He descends through a Dark Night to his centre, experiences illumination and ascends to a unitive vision – of Existence, Being, Non-Being and the One – that reflects the four interlinked worlds of the Kabbalah which so attracted Blake and Yeats. Previous accounts of the Mystic Way in European poetry only briefly touch on the vision of God, as do those of Dante, St John of the Cross and T.S. Eliot. In this selection, which covers all stages of the journey, the vision of God as Fire or Light is central rather than a glimpse at the end. Detailed notes help the reader with the many traditional, metaphysical and scientific references. Two important essays supplement the mystical vision in the poems. In the first, Nicholas Hagger explains how the Baroque vision unites the social and metaphysical worlds of the social ego and spiritual consciousness, and the Classical and Romantic views of man, and makes possible a new kind of poetry which combines statement and image. 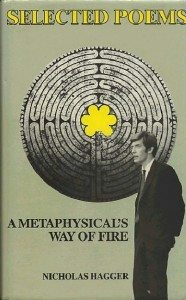 A second essay, On the Metaphysical Revolution, relates the existential vision of the Fire to the three traditional aspects of metaphysics – cosmology, epistemology and ontology – and states an Existential Metaphysics or Metaphysical Existentialism in which Being is experienced rather than the object of rational speculation. The poet’s vision of the Fire revitalises the metaphysical tradition and effects a Metaphysical Revolution. Here is a polished, layered poetry that, for all its profundity and references, is readily accessible to the reader and challenges the secular view that is so widespread in Western culture. What is the meaning of life? And what is the nature of the consciousness that perceives its meaning? With such questions in mind, and his soul awakened, a young poet living near London sets off on a journey into the labyrinthine maze of the Mystic Way. His poems show his gradual transformation as he increasingly lives behind his social ego in a new centre in his soul and spirit. In the Far East he glimpses the divine Fire. After a Dark Night and a painful purgation of his sensebound attachments in North Africa, he returns to London and again fully encounters the metaphysical Fire which is at his own centre and at the heart of the universe. Profound experiences of illumination and visions lead him to a contemplative love of quiet, rapture and certainty. After a further spiritual purgation, when sense and spirit are in harmony and Nature is seen to be dynamic, he instinctively perceives Existence as being enveloped within Being and Non-Being which manifest from the One, and he comes through to a unitive vision of the fourfold universe. It is the vision of the Zen stone garden. He has arrived at a vision of meaning.